This pretty pink Champagne sorbet recipe is the perfect dessert for the holidays or any occasion. 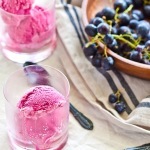 Place the grapes, pink Champagne and sugar in a saucepan over a medium low heat. Bring to the boil and reduce to a simmer. Reduce heat to low and simmer for 10 minutes or until the skins of the grapes split. Drain through a fine sieve into a large jug or bowl and use the back of a wooden spoon to press the grapes to release their juices. Extract as much from the grapes as you can. Cover the mixture and refrigerate until completely cold. I usually leave the mixture overnight. Remove the mixture from the refrigerator and add the lemon juice and pour into your ice cream maker and churn according to your manufacturers instructions. The longer you churn the sorbet the lighter in colour it will become. Once you have cooked the grapes you will notice the mixture is incredibly dark. Don't worry because the sorbet will lighten when it is churned in the ice cream maker. Did you make this recipe? I would love to see your results! Share a pic on Instagram and tag me @deliciouseveryday. Find more delicious vegetarian and vegan recipes at www.deliciouseveryday.com.